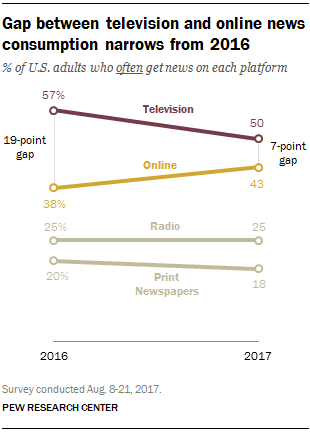 4Two-thirds of Americans (67%) get at least some news on social media. This represents a modest increase from 62% in 2016, but similar to mobile, this growth was driven by substantial increases among older Americans. 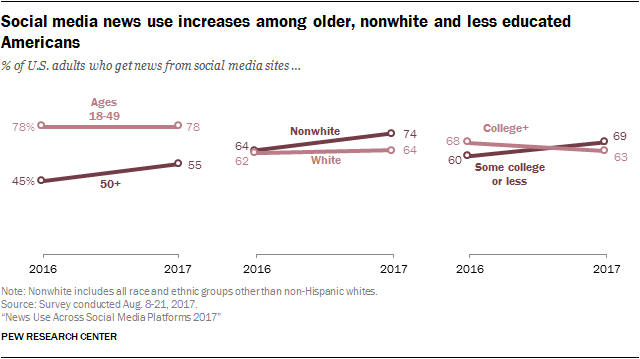 For the first time in Pew Research Center surveys, more than half (55%) of Americans ages 50 and older report getting news on social media sites, a 10-percentage-point jump from 2016. Three of the social media sites measured – Twitter, YouTube and Snapchat – grew their shares of users who get news on their site. Twitter saw the largest growth in 2017 (up 15 percentage points) and had the largest share of users to report getting news there (74%). 6Many Americans believe fabricated news is sowing confusion, and about a third (32%) say they often see made-up political news online. Nearly two-thirds of U.S. adults (64%) say fabricated news stories cause a great deal of confusion about the basic facts of current issues and events. About a third of U.S. adults (32%) say they often see made-up political news online, while 39% sometimes see such stories and 26% hardly ever or never do. About half (51%) say they often see political news online that is at least somewhat inaccurate – a higher proportion than those who say they see news that is almost completely made up (32%). About a quarter (23%) say they have ever shared made-up news stories themselves, with roughly equal shares saying they have done so either knowingly or unknowingly. A large majority (84%) of Americans say they are at least somewhat confident in their ability to recognize fabricated news. 7Americans have low trust in information from social media. Just 5% of web-using U.S. adults have a lot of trust in the information they get from social media, nearly identical to the 4% who said so in 2016. This level of trust is much lower than trust in national and local news organizations, and in information coming from friends and family. In fact, in a separate study focusing on science news about twice as many social media users distrust science posts on social media as trust them (52% compared with 26%, 21% of social media users do not see any science posts). 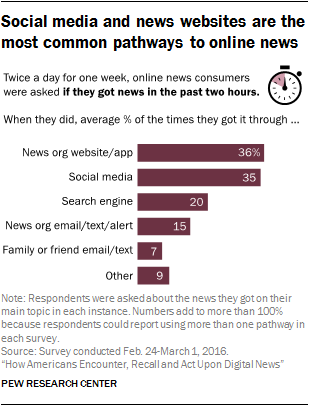 9Online news that comes via emails and texts from friends or family is the type of news encounter most likely to result in a follow-up action. Among the five pathways studied, news instances spurred by emails and texts from friends or family elicited the most activity; nearly three-quarters (73%) of these instances were acted upon in some way. That outpaced social media and direct visits to a news organization’s website, where a follow-up action occurred in about half of news instances (53% and 47%, respectively). Overall, talking with someone offline, whether in person or over the phone, was the most common action taken with digital news. 10An analysis of nearly 2,700 different search terms associated with the water crisis in Flint, Michigan, shows that online searches can be a good proxy for the public’s interests, concerns or intentions. The data revealed that residents of Flint were searching for information about their water before the government recognized the contamination and before local and regional news media coverage intensified beyond a handful of stories related to the initial switch of the water supply. While news was the first type of information people searched for, questions about personal and public health implications soon came to the forefront. The politics of the water crisis – which involved the governor of Michigan, the city of Flint and several agencies – did not resonate as a local search topic until President Barack Obama reacted, when the story spread nationally.